No, this is NOT thoughts about being a coward! Got that?? LOL It was thinking back on how my Dad cooked chicken bbq that got this post started. Miss ya, Dad! I grew up in a very small town in SW LA. My parents were, indeed, genuine, true Cajuns. Some of my best memories from back then are of bbqs that we’d have at home almost always on a Sunday. Mom would get together with Aunt Bertie on Thursday and they’d cook up a huge pot of Cajun bbq sauce. It was thick and chunky with onion and bell pepper and celery pieces, salt and pepper and garlic powder, catsup and tomato sauce and tomato paste, made with love and ending up all tomato-ey and overall absolutely scrumptious! Us kids would dip pieces of bread in it and eat the sauce just like that till Mom shooed us away! LOL Since we didn’t have the bbq until Sunday, the flavors had a chance to meld and mellow in the ice box till it was time to take some and put it in a small pot, cover with vegetable oil and heat it to boiling. Then, they’d pour off the oil to use for basting. Saturday night, Dad started things off by splitting a couple of chickens, getting a couple or 3 pork chops, digging out a piece of sirloin steak from the freezer, making up some hamburger patties, get a big hunk or 2 of Cajun pure pork smoked sausage and, about my favorite (don’t tell anybody, but it’s STILL one of my faves!! ), a whole pack of hot dogs! He’d use a big full size cookie/cake sheet to hold it all and start seasoning. The chicken came first. A bit of salt, a good shake or 5 of black pepper, a light dusting with garlic powder, a sprinkle of paprika, turn over and repeat. Next, on top of the chicken, came the pork chops and steak. Same-o-same-o on the seasonings. Finally, on top, he’d lay the hamburger patties out and the sealed package of hot dogs. The sausage was seasoned enough that it just was plopped wherever it would fit. Then, cover with a dish towel and into the ice box overnight. Come Sunday morning, it was early Mass for us! 7 AM in the morning! We’d all get up early and head over and attend. It was usually over about 8 AM. We’d come home, change out of our Sunday clothes and Dad would get started. About that time, Mom and Aunt Bertie would get started on the side dishes of oven bar-b-que baked beans, cole slaw, potato salad and garlic bread. They’d usually put in a pecan pie, too. He had a 55 gallon drum that had been sliced in half, hinged at the back, a handle put on the top front, and mounted on legs. Back then, these big metal drums had screw-in bungs. 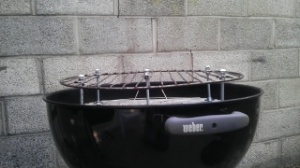 The bbq pit was always set up to that the bung was on the lid part, at the top. It was removed when the cooking was going to start and acted kinda sorta like a chimney. 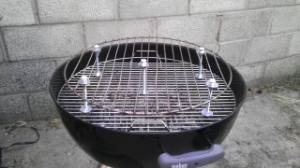 The guy who made them would cut air vents in each end at the bottom that were used to control the heat and coals. The pit always got set up under a big old pecan tree for the shade. There were a few chairs around for my Dad, my uncle (usually Uncle Lincoln and Aunt Bertie were there) and maybe a couple for the kids if we were good. About that time, the radio got plugged in and tuned to a “chankey-chank” station with good Cajun music. IIRC, it was a station in Eunice, LA, on the AM dial. Dad was a big fan of charcoal, not briquets. Back then (we’re talking late 50’s to early to late 60’s), we didn’t have fancy stuff like chimneys to light the coal. The coals went on the bottom of the barrel in a pile. He’d set the end vents open all the way and then give the charcoal a splash of kerosene, let it soak for 5 minutes, then toss on a strike-anywhere kitchen match that he had lit. After the flames died down (lid open) and the kerosene smell went away, he’d spread out the coals and put on the cooking grates. 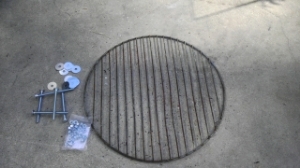 After a couple of minutes, he’d get out the big pliers, grab the grates with the pliers and then use a stiff wire brush to clean the grates. When the grates were clean, he’d put them back over the coals and it was time to sit back and relax a bit and get the real bbqing going. Dad would take the chicken halves and put them on first. A little sizzle when they hit the grill and then lid down. Every 20 minutes of so, he’d take some of the oil from the bbq sauce Mom and her friends had fixed on Thursday and give the chicken a good baste with it and flip them. Course, it was beer time, too (not for me, though I was too young. 😦 LOL). While the chicken was cooking, he’d keep adjusting the side vents to keep the temperature juuuuuusssttt right and use a little piece of wood to hold the top of the pit open just a little, no more than an inch. Nope, no thermometer, just experience. After a couple or three of hours of turning, basting, basting, turning and pulling and twisting the leg at the end till it was loose which showed the chicken was done, he’d put the chicken halves on one side of the pit, move the coals over to the other side of the pit and put on the pork chops, the sausage hunks and the steaks. He’d cook those for about 30 minutes, flipping every 10 minutes or so. 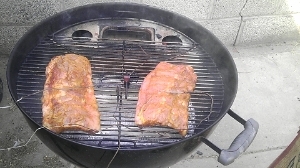 By then, the coals was dying down pretty good, so he was doing “low and slow”. When the steaks, sausage and pork chops were done, he’d move them over onto the chicken halves if there wasn’t enough room on the cool side for them to sit on the grate. Generally, they’d get one or 2 swabs with the bbq sauce basting oil at each flip and then get set on top of the chicken. Last but certainly not least, he’d open the side vent where the coals were, give them a few minutes to heat up and then he’d throw on the burgers and hot dogs. The burgers went on over the coals, the hot dogs on the side of the coals. They cooked the quickest, so of course they were the last to go on. The coals were still about medium low, so it took another 20 or 30 minutes to get them done, being VERY careful with the hot dogs, turning them every few minutes so they wouldn’t burn. When the burgers and hot dogs went on, it was time for the ladies to start setting the table and getting out the potato salad, cole slaw, bbq baked beans and french bread that had been split, buttered, garlic powdered, wrapped in foil, and put into a warm oven about 10 AM. By 1 PM, it was time to eat! A nice blessing of the food then everyone sat down and dug in. Oh mannnnn!! Dad would take a sharp knife and cut the chicken halves into quarters and then split off the legs from the thighs and the wings from the breasts. Usually it wouldn’t take hardly any knife work, the chicken would just pull apart at the right places. The steam would rise and the juices would flow clear. Then we’d get our choice..a leg, a thigh, wing section or some breast. Add a piece of steak, a little pork chop piece, a small slice of sausage, a burger and a hot dog and there wasn’t hardly room on the plate for the side dishes! But we’d manage to get some of each of them on the plate. Spread out some of the homemade bbq sauce all over and then chow down. OHHHHHHHH! After we had eaten about all we could, Mom would bring out her special homemade pecan pie. It was heaven in a pie tin! Of course, after all of that, it was time for a little nap. Then leftovers for the next day or so. MMMMMMMMMMMMMMMMmmmmmmmmmmmmmmmm!! !